Why is it recommended to register a Belkin device to the Belkin Support site? Registering your Belkin product in the Belkin Support site allows you to get the latest updates regarding your device. You will also have access to support tools and knowledge base articles that will help you easily configure or set up your Belkin device. 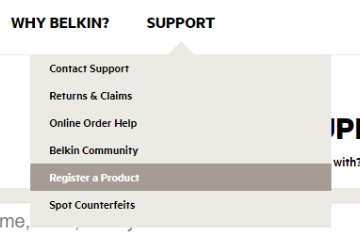 This article will guide you on how to register products to the Belkin Support site. Open a web browser and go to the Belkin Support site. 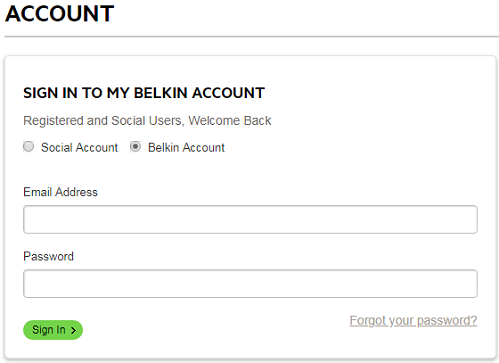 Log in to your Belkin account by clicking on the Log In / Sign Up link at the upper right side of the screen. Alternatively, you can also click on My Account at the bottom left part of the screen. 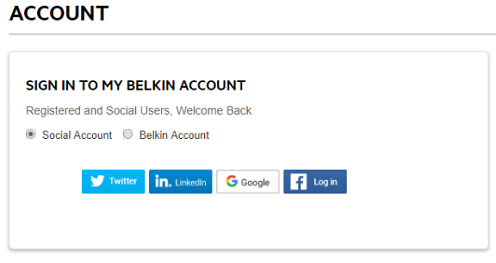 Select Belkin Account and enter your credentials in the fields provided then click Sign In >. If you have not created a Belkin account yet, click here to learn how. You may also sign in using your Social Account. Once signed in, hover your mouse pointer to the SUPPORT tab at the top of the page and click Register a Product. Alternatively, you can also click on the link at the bottom part of the screen under Support. On the Register a Product screen, SELECT PRODUCT CATEGORY or type in your device's model number under FOR WHICH PRODUCT? and press [Enter]. Enter your device's Purchase Date and Serial Number then click REGISTER PRODUCT. Once the product registration is successful, you will receive the message below.